I know Lance has done load development for numerous CA rifles including my three. He would be my go to guy to ask! 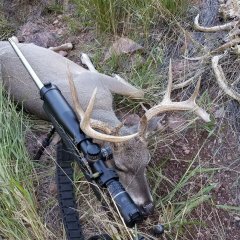 Interests:Long Range hunting & shooting, Reloading, Custom long range rifle builds. 68-69 of H-1000 with the 168 Bergers or 70-71gr of Retumbo with the 180s has always given me excellent results. Doesn't matter what rifle it is. I have a Mesa in 7 mag 68 grains H1000 and 162 eldx shoots great never could get Berger’s to shoot as good as the eldx in this gun. Bergers like to be seated very close to the lands in my experience. When I shot the 168 VLDs, my go to load was 69 gr H1000, .010" off the lands, norma brass, and wlrm primers. I have seen that load work in 3 other 7mm Rem Mags too (one savage, two howas). I have since put a custom barrel on my rifle, and shoot the 175 eldx. I also shoot the 162 eldx out of a 7 SAUM. They are the easiest bullet I've ever worked a load up for honestly. They shot great no matter where I loaded them off the lands, and with almost every powder weight I tried. H4831SC seems to be a great powder choice for the 160 grain bullets. It's not the fastest but its been VERY accurate.